38 Preparations 100 times magnification’ . Besides confirming the taxonomy (Clepsine marginata = Hemiclepsis marginata) and origin based on Whitman’s study, the catalogue reveals that there were 38 models in the set, indicating that 2 models from the Grant Museum have not not survived. The full text given in Weisker’s catalogue lists the various stages of the models such as the ‘preliminaries of the furrow’, the ‘formation of the ectoderm and mesoderm’, the ‘installation of the germline’ and ‘system of entoderms and nervous system’. These descriptions make it possible to identify the individual developmental stages of the leech embryo through comparison with Whitman’s illustrations and/or Weisker’s models. The question of how these models came to Grant Museum remains. Despite the fact that there is no documented date of entry in the museum archives, the identification of the models may help in this line of inquiry. When C.O. 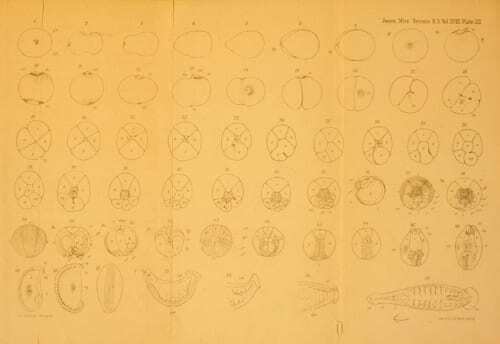 Whitman’s The embryology of Clepsine (1878) was published in the Quarterly Journal of Microscopical Science, E. Ray Lankester was not only the editor of the journal, but also the Professor of Zoology and Comparative Anatomy at UCL and curator of the Grant Museum. Lankester, (who also made important contributions to embryology and is duly referenced throughout Whitman’s paper), was an advocate of object based-learning who encouraged his students to use specimens as teaching aids. Throughout his time at the Grant Museum (1875-1890), Lankester continuously added to the collections including acquiring numerous other wax models and embryological series made by Rudolf Weisker and Studio Ziegler for use in his teaching practicals. It seems possible, if not likely, that Lankester was responsible for the leech series being added to the collection if not through his purchase of the models for use in the classroom, then perhaps as a gift from Whitman himself. If the models were a personal gift to Lankester, this might explain why they were not listed in the Museum’s earliest accession register (known as the 1890 Lankester Grant Museum Catalogue) unlike the other wax models in the collection at this time. While not all of the mysteries surrounding the models have been uncovered, the research and process of identification of the wax leech series has given them a scientific and historical identity which was previously unknown. This research has illuminated the forgotten value of these models as important objects in the history of embryology and zoological teaching. See the models on display in the new Octagon exhibition Spotlight: Illuminating Stories from UCL Culture from 16th May 2017. Many thanks to Nina Davies, Clare Drinkell and Alice Tofts for their fabulous research of the Weisker Hemiclepsis marginata models and for providing the group image of LDUCZ-G525. 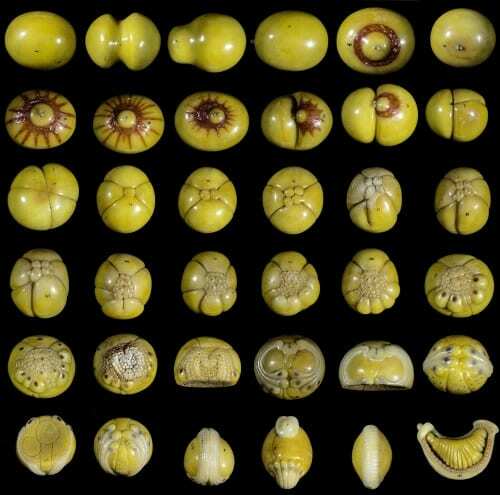 Thank you to Marie Bournonville from the Aquarium-Muséum de l’Université de Liège for finding a duplicate set of the Hemiclepsis models and supplying images. Many thanks to the following embryologists for their generous advice and suggestions : Dian-Han Kuo, David Weisblat, Art Woods, Gerhard Scholtz, Amy Moran and Roy Sawyer. Whitman, C.O. 1878. The embryology of Clepsine. Quarterly Journal of Microscopical Science Vol. 18, pp. 213-315. Weisker, R. 1880. Naturwissenschaftliche arbeiten aus dem Institut für Wachsbildnerei von Rudolf Weisker Dr. Phil. Leipzig.